Businesses often find that they have to relocate to larger, or more cost-effective locations. Other times it's simply a matter of wanting a better office or shop environment. Either way, it involves moving everything and that can be a challenge. No matter how many times your business may have moved in the past, it is still a complicated and labor-intensive task. And if you've never moved before, it can also be overwhelming and stressful. Fortunately, there are a number of tried-and-true tips to make your office relocation go much smoother. Sometimes relocating your office is unavoidable. But moving your office space with all the equipment, files, and office furniture can be a difficult task. In fact, it is no surprise that many businesses hire moving firms to take of everything. However, many smaller businesses still decide to do it themselves. And, while this is certainly an option, the massive numbers of boxes or the large furniture and office equipment, can take a lot of work. How many people move every year in the United States? According to the Census Bureau almost 40 million Americans relocate each year altogether. And, according to the USPS, about 38 million change-of-address forms get processed annually. While, there are no official records of business moves, we all know that many businesses will move each year either because they find a better lease deal, or they need to expand and have outgrown their current home. Probably the biggest mistake business owners make when relocating is to do so without a well-thought out action plan. With so many moving parts and disparate needs that must be considered simultaneously, this can be a recipe for a minor disaster. If a move requires that you suspend business for a period of time then it becomes imperative that everything go as quickly and seamlessly as possible. At no time does the old maxim, "Time is money" ring truer than when you're not open for business. Before you make any moves (no pun intended!) with your office relocation, you should create a plan for steps to take, services to transfer, items to be packed and transported, vendors and others to be updated, etc. A multi-faceted action plan with timelines and assigned accountabilities will save you a great deal of grief later on. These tips involve a great deal of common sense, but the fact is that a typical office move can be so complex and involve so many people that these can be easily missed or overlooked. The first step in reducing the stress created by office relocation is sorting. Sorting helps you determine which items need priority to be productive during office relocation. Quite possibly the first things you will need are phones, computers and Internet connectivity. Sort the items into three categories such as “must have”, “need soon”, and junk. By getting rid of the junk first, you can move less items and get back to work faster. Oftentimes, it's best to get rid of much the office supplies and equipment that are old becoming obsolete. Evaluating office equipment and furniture is a necessity, as well. It may be better to invest in new items than to go to the trouble and expense of packing an moving old ones. Office relocation is also a great time to start reorganizing your office layout and workflow. Ideally, you will have already drawn this up with available floor plans, etc. In addition to sorting and determining which furniture and equipment stays or goes, you should also determine where each item is placed and how you want to lay out the cubicles and furniture for a more efficient and comfortable office layout. Label and set aside anything that you plan on getting rid of or donating. Any items that you plan on storing for future use should also be labeled as such and staged in a different location. By separating and staging boxes and other items, you can streamline the moving process later. Keep your necessary office supplies in one place, update the filing system of your documents, and create a separate bin for documents that need an immediate decision. Hiring a professional junk removal firm to facilitate and expedite your office relocation can be a strategic and cost-effective move. Having someone else do all the lifting and moving frees your staff to be back at work sooner. 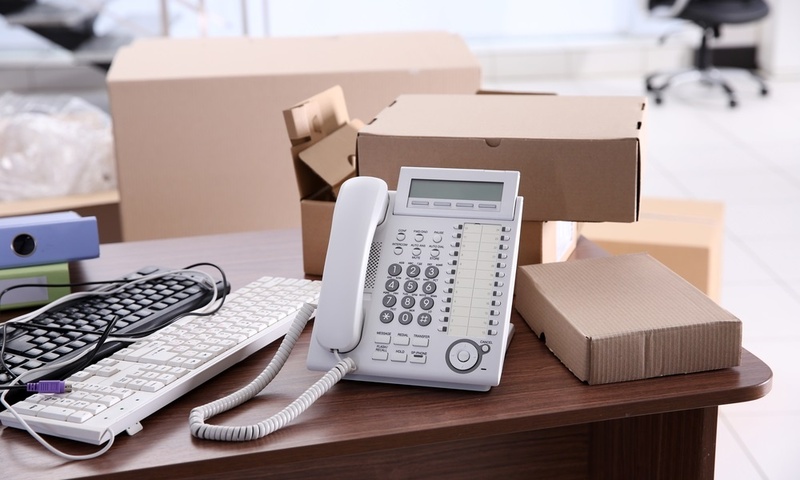 Because you are losing productivity during an office move it pays to have a company to handle the furniture removal and large office equipment removal. 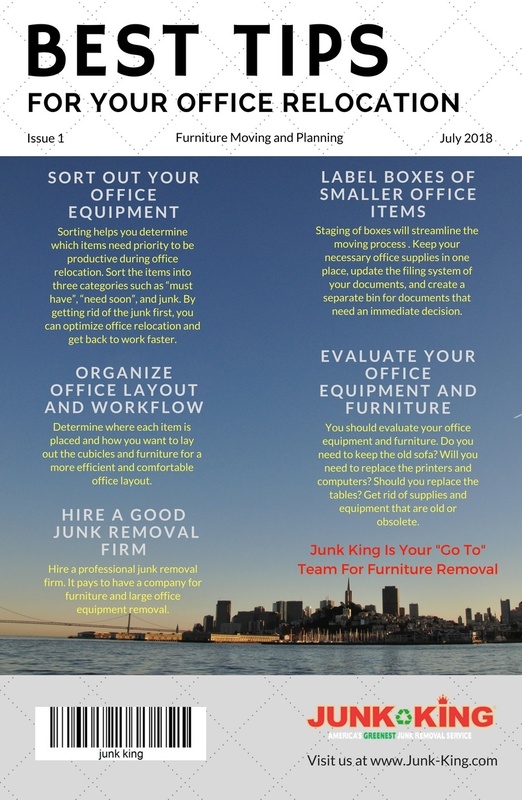 Junk King provides an efficient, safe and eco-friendly furniture removal service so you don’t need to worry about the pick up or disposal of the debris after your office relocation project is complete. Whether you need our services several times during a cleaning project or just once after it is complete, our hauling professionals will ensure that the junk and debris is out of your way so that you can get on with the job of running your business. Our team specializes in commercial junk removal. And we can be at your business in minutes, so call us today! You can be assured that our crew is fully insured and well-trained, so you can trust them to get rid of your unwanted items in a professional and courteous fashion. One of the best things about hiring Junk King is that we recycle a much of the material we pick-up. We do this as part of our genuine commitment to being an eco-friendly removal service.